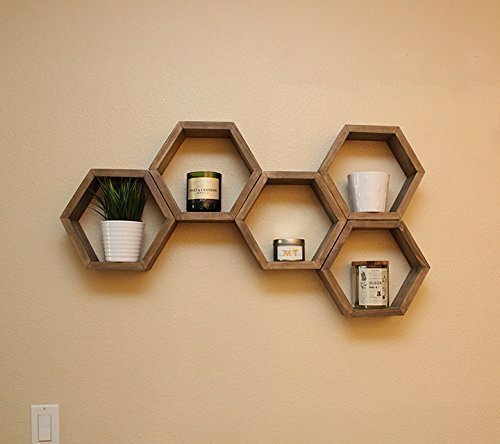 The Hexagon Floating Shelves are great for any room in your house. They are great for wall storage by putting small planters with succulents or leaving them empty to add an accent color to your the room. Q: What are the dimensions of the Hexagon Floating Shelf? Q: What type of style is the Hexagon Floating Shelf? Q: What other stains are available? 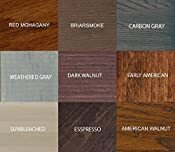 A: Dark Walnut, Red Oak, Early American, Weathered Gray, American Walnut, Espresso, BriarSmoke, Carbon Gray, Sunbleached. If you have another stain in mind, please contact me for a custom order. Q: How are the Hexagon Shelves installed? Q: What goes into building the Hexagon Floating Shelf? A: The Hexagon Floating Shelf is sanded with three different grits of sandpaper, conditioned with "Wood Vitamins", stained to your desire, and finished with a high end sealant. Wood is a natural, unique material that has variation from board to board. The product you receive will be the same shape, size, and relative color as the image, but natural grain and stain differences may occur between the representative photograph and the product you receive. Feel free to a contact me with any questions you may have!